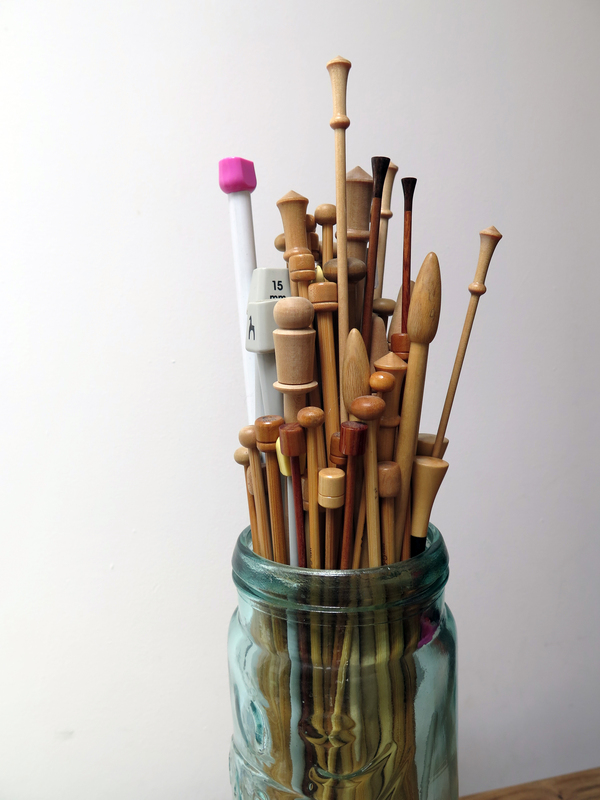 Last week when we were talking about knitting in the heat a number of people mentioned using wooden or bamboo needles, which reminded us of the importance of choosing the right needles for particular circumstances. Having the right tools for a project can make a difference. We will all have a particular preference for our needle materials – some of us always go form metal , others always grab their bamboo sticks – but sometimes the type of needle you choose can have an impact on how your knitting turns out. For example, a very smooth yarn like cotton may slide off particularly smooth needles so ones the grip a little more could be hand here. Also because different fibres slide differently on different needles you may find that sometimes it is easier to get the correct tension on one set than another event thought they are the same size. This is because the drag or lack of it on the needle can make a difference to how tightly the loop of each stitch pulls. If you have a range of needles in different materials it can be worth experimenting to see how each material works with different fibres for you – remember needle choice is very personal – as well as having a little knowledge about how different materials behave. Most of us will have a few of these in our kit. They can be cost effective starter needles plus they tend to be lightweight and can come in attractive colours. Being lightweight can be particularly useful with chunky yarns that require fatter needles. They have some flexibility which can make them more comfortable to knit with however because they are smooth, stitches may slip off your needles when you don’t want with some yarns. A second downside is that some people find these needles generate some heat as you knit which can be uncomfortable. Metal is a very traditional needle material and the one most associated with the click-click people refer to when talking about knitting. There is quite a lot of variety within the metal category. Needles may be brass or aluminium which can effect weight and different finishes can make them smoother or grippier. They are strong which make them a good choice for finer needles and smooth metal needles are great for building up some knitting speed. However, they are less flexible and often heavier than the other common materials which means some people find them tiring to work with. They are also affected by the temperature around them so can feel very cold or warm when you pick them up. Like metal, the finish and type of wood can make a difference to the actual needles but overall bamboo and wooden needles are flexible with a little grip. Plus the natural materials do not tend to get too hot or cold. However, finer needles may be too flexible and risk breaking. In addition it is important to look after your wooden and bamboo needles to they do not chip or splinter which will have an impact on how your yarn slides on the needles. Made from the same material as F1 cars and racing bikes, these high-tech needles combine the flexibility of wood, the lightness of plastic and the strength of metal. But they are a more expensive option than many needles to it is worth trying out pair to see how they suit you but many people recommend them for sock knitting in particular. Let us know what type of needles you prefer. Until just recently, I always used bamboo. I now tend to use aluminium or steel. I did have a few plastic needles but gave up with them when one snapped half way through a beanie I was working on. I’ve got a mixture of types but I prefer wood or bamboo because I have arthritis. I like the wood and bamboo needles…mainly when I am knitting with a large number of stitches….the metal and hard plastic hurt the crutch between my thumb and index finger. I knit the traditional way, not European…or other.